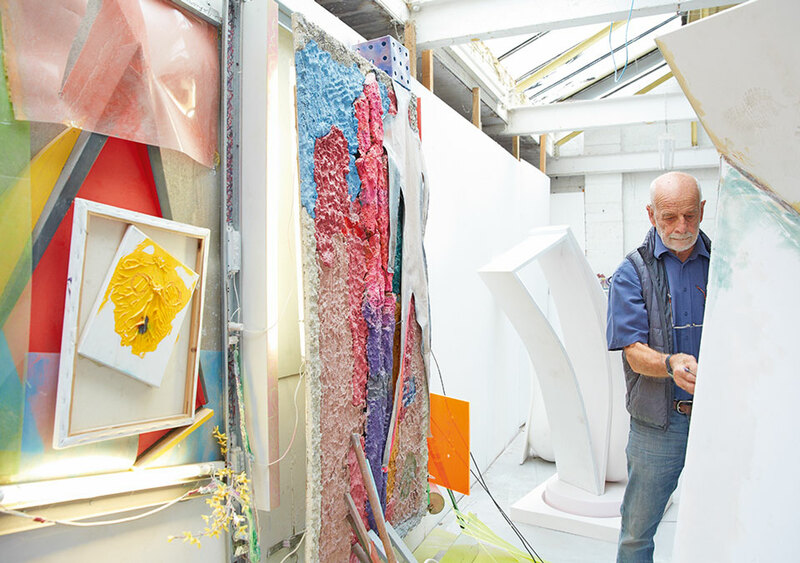 ‘I’m a very hands-on sculptor – I like being around the studio, fiddling about with materials and things. Discovering things as I work.’ Phillip King is in his north London studio, dressed in practical jeans and a blue gilet, pens in his shirt pocket. He comes here most days in his old Ford Ka, still working for up to eight hours despite having recently turned 80. I don’t have too many assistants and they work part-time. I used to have more, but I just like to be on my own. I think it’s a pity that people lose track of the making process. We’re in a former workshop off a main road near his home. Across the road is a builders’ merchant at which King is an almost daily customer. Inside the studio is like a bigger version of a grandfather’s shed – workbenches littered with power tools and tins of acrid sealant, shelves lined with boxes of odds and ends, scraps of material left over or waiting to be used. Outside are the remnants of a lorry load of slate he acquired in the mid-1970s and hasn’t quite exhausted. 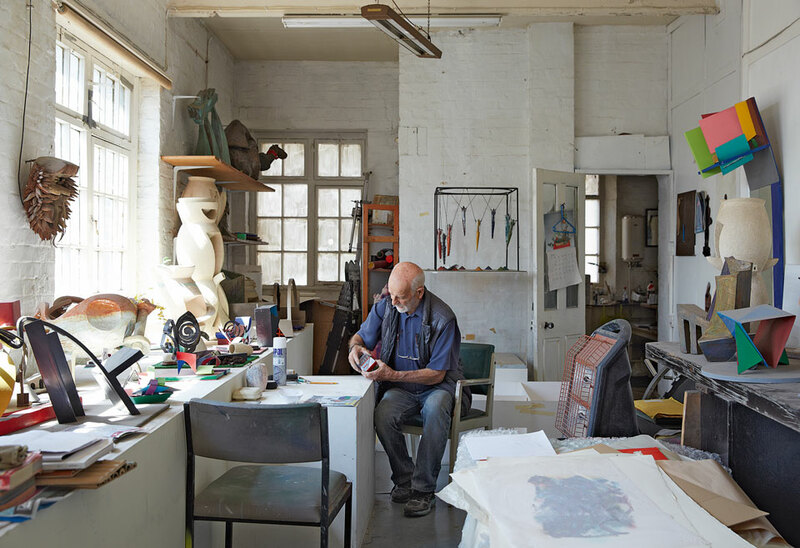 Roof lights at the back of the ground floor create a perfect working space, where he is currently turning a six-inch model into a six-foot sculpture – he doesn’t do preparatory drawings, preferring to develop the work as he goes. Upstairs is an office and kitchen, and a kind of gallery lined with maquettes and test pieces: some recent, some from the beginning of his career. Roughly drawn little people give a sense of proportion. One large model of a yet-to-completed work shows a whole gallery, with sculptural elements made from bamboo and a special fluorescent plastic that glows around its cut edges. King loves discovering and using new materials. 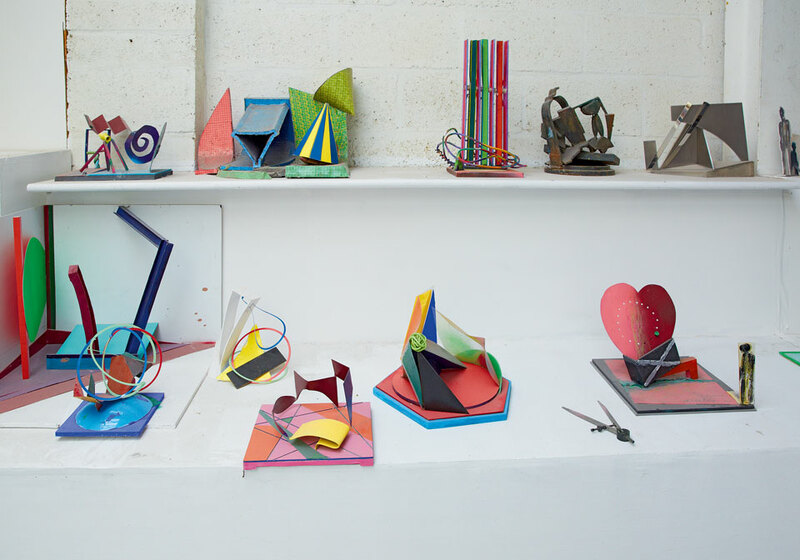 In the late 1950s he studied at Saint Martin’s School of Art under Anthony Caro, and together they helped to bring abstraction into British sculpture. 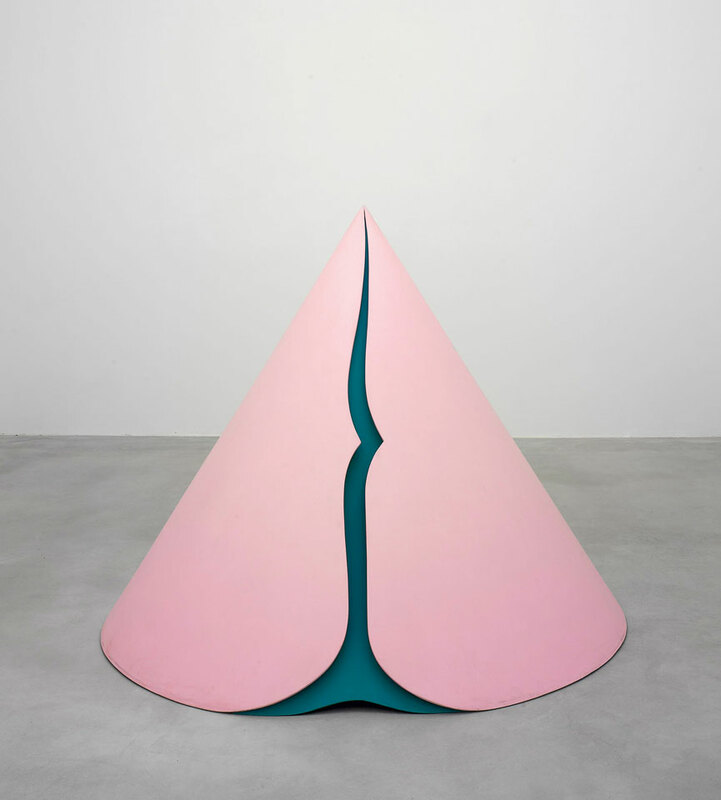 But while Caro was working solely in welded and bolted steel – on pieces such as Early One Morning 1962 – King was experimenting with plastic and resin. For 1962’s Rosebud he put resin on a conical mould to create an object that is unsettlingly organic. Unusual colour choices – flesh pink, deep purple, bright pastels – add to the alien effect of his work from this period. Now he searches online for materials – ‘It’s marvellous. I’m not very good on computers, but I can get around a bit.’ Foam PVC panels sourced from Oman, which are lightweight enough for him to create large sculptures single-handedly, were a recent discovery. He also sometimes incorporates elements he has found in skips or when walking in the park. King was born in Tunisia in 1934 and was there during the Second World War, when the German and Italian armies evacuated right in front of his house. ‘You could see the bombing and ships being blown up.’ It was an unfettered but sometimes dangerous childhood. ‘I had eight guns at one point. I hid them in the garage and used to go shooting. I remember taking dynamite out of shells and setting fire to it. I’m lucky I survived!’ He left in 1945 and is planning to go back soon for only the second time. In England he studied modern languages at Cambridge before becoming interested in sculpture and going to Saint Martin’s. As well as being taught by the strong-minded Caro, he went to work for Henry Moore as a studio assistant, where he was impressed by Moore’s professionalism and gained the courage to work on larger sculptures than the small clay and plaster ones he had been experimenting with. But it was painting rather than sculpture that was the biggest influence on King and his peers: specifically the verve and optimism of abstract expressionism. ‘We were talking about American painting and nothing else. How do you get that kind of energy into sculpture?’ He started trying to emulate Jackson Pollock or Franz Kline in three dimensions. He rediscovered the work of Constantin Brancusi. ‘It didn’t interest Caro or [Clement] Greenberg – for them Brancusi was a dead end, but I saw him as a beginning.’ While Brancusi created primitive sculptures by piling things on top of other things, King made work by leaning one thing against another – the origin of his conical pieces such as Rosebud. In the decades since, he has become particularly well known for his large outdoor sculptures: a recent show in Chelsea included old works remade in steel, as well as new ones. But this was something he was initially reluctant to get into. When I started making sculpture for outdoors, I was very worried. It didn’t seem to be right; it’s an indoor thing, colour. My work is all made indoors in a studio environment, and it felt like you were winning back poetry for sculpture. You didn’t have to consider the environment or other people, you were just on your own with the material in a space, making art. It’s a rare luxury for sculptors to be able to do that. But now I can go out and make works that fit the environment. King has become more involved in placing sculpture in the landscape as a trustee of the Yorkshire Sculpture Park. He was a trustee of Tate in the 1960s and more recently has been president of the Royal Academy. But he quit the latter when he realised he was producing hardly any art. 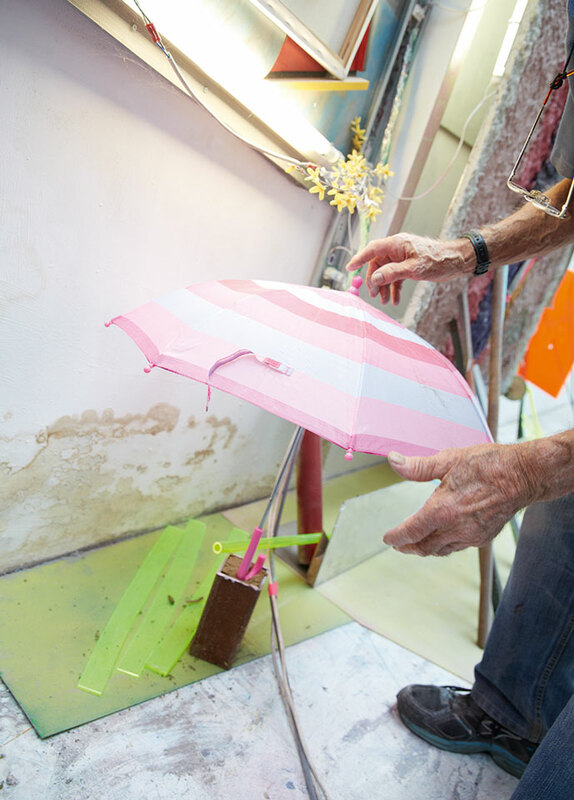 After creating sculpture for almost 60 years, it is clear that he still loves just being in the studio, making things. A display of Phillip King’s sculpture runs at Tate Britain from 8 December 2014 to 1 February 2015. 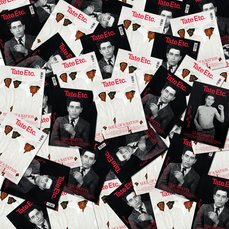 Lee Cheshire is the editor of Tate Guide.